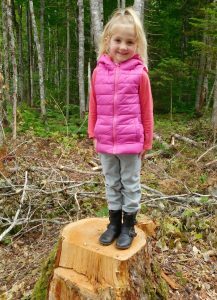 Sheila Arsenault and her daughter, Danika have been dreaming and planning Treetop Haven for a long time… And now it is yours to enjoy and create memories and experiences to last a lifetime. Sheila and Danika are avid travellers and love talking to people about their travel experiences. Sheila has explored over forty countries around six continents, while Danika has been to ten countries – pretty good for a five year old! Sheila has stayed in beach huts, bush camps, hostels, trains, cruise ships and luxury hotels. She found that her best memories have been in the unique accommodations that were more personalized. She wants to offer this to you. All around the world, Sheila has met and talked to many travellers and the two main questions she found herself asking them was: what destinations do you recommend and where did you stay? Sheila believes that accommodations are a large part of your travelling experience. She wants to make the accommodation an amazing experience, as well as the destination. Prince Edward Island is an incredible destination and has so much to offer. It is one of the most beautiful islands in the world. When you have such an amazing destination, your accommodation should match. Treetop Haven compliments Prince Edward Island and it will be a trip of a lifetime. Sheila has her diploma in Travel & Tourism Management, as well as her Red Seal as an Electrician. Danika has graduated from preschool and now takes the school bus to kindergarten. Danika enjoys swimming, karate, gymnastics, and dance. Danika wants to be an Interior Decorator.